I remember the first time I picked a chanterelle in Canada. My farm hosts, who’d been foraging on the island for decades, taught me how to identify a couple of different types of mushrooms found commonly around the farm where they lived. Off walking on my own one day, I spotted a golden trumpet poking through the forest floor. Feeling confident enough with my newly learnt knowledge, I gathered a few dozen of the mushrooms along way and returned to the farm overjoyed at my finds and ready to cook up a storm. Those chanterelles still stick with me as one of the best meals I've ever eaten. Coming back to the UK I didn’t know where to start; I wasn’t sure where to go looking for mushrooms, or even what types were commonly found over here. So when Martin Bailey from Go Foraging invited me on one of his mushroom foraging walks in Hampshire, I jumped at the chance to dive back into the wonderful world of mushrooms. We gather in a pub car park at the edge of a piece of woodland; a cluster of people accumulate, drawn together by the realisation that those other people loitering around are probably waiting for the same thing as you. We chat amongst ourselves before Martin arrives and introduces the walk ahead. Diving straight into what mushrooms are (the fruiting body of an underground organism, consisting of thread-like mycelium), he explains that harvesting mushrooms is harmless to the fungus, but that we will only take enough for us to eat. Along with a few basic guiding principles for the walk, we divvy up the supplies for lunch between the group, shoulder our backpacks and head into the woods. It’s a beautiful autumn day, probably the best time of year to be in the woods. The leaves are falling, forming a crisp brown carpet underfoot, and horses mill about in the distance, observing our progress curiously. Within a few minutes there’s a cry from a member of the group who has spotted our first mushroom of the day and we all stop to look. We discover a few fascinating but inedible mushrooms before we find an amethyst deceiver. 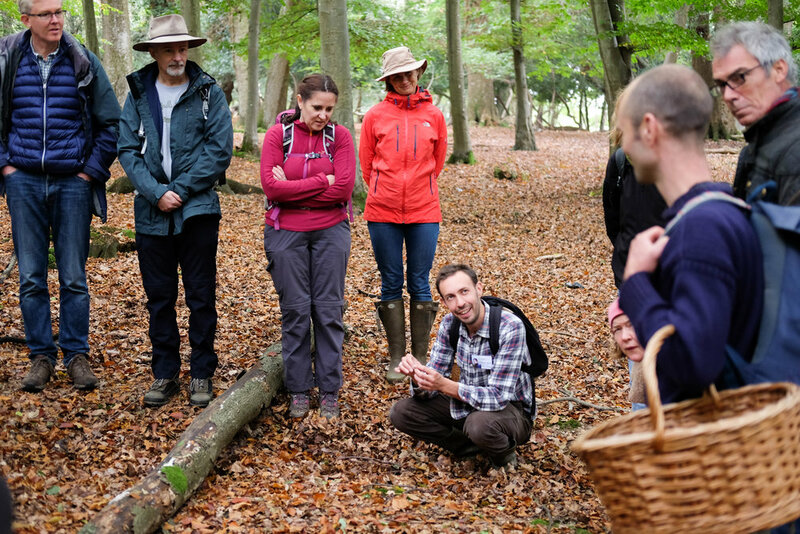 Martin and fellow forager Ru talk us through the different characteristics of the mushroom and things to look for when identifying them, and before long we’re all spotting them across the woodland floor, their distinctive purple colour standing out against the autumnal colours. We slowly amble our way along, some venturing further afield (‘free ranging’) in hunt of specimens, others clustered around Martin or Ru as they talk through a particular mushroom. I’m fascinated by the False Death Cap, one of the Amanita family, which despite its terrifying sounding name is edible. Martin points out that despite the fact he can confidently identify them, he’s never eaten one. I sniff the mushroom as its passed around and the vague smell of raw potato lingers with me as we walk on. Martin carries a book with him as we walk and regularly pulls it out, highlighting the need to refer to books and guides, even when you’re a practiced forager. “Even if it’s a mushroom you know well, take a few moments to check your assumptions and identification,” he points out. Time appears to be the key factor - the more time you spend foraging, the better you get to know each type of mushroom through the changing seasons and different stages of its growth cycle. I’m excited when I stumble upon and correctly identify the first chanterelle of the walk, and after being passed around the group so the others can take a closer look, it gets added to the growing basket of finds. We pause for lunch, sitting on some fallen logs and Martin pulls out a series of things for us to try as he fries up some mushrooms. Homemade mushroom pâté, kimchi and pickled wild garlic seeds find their way onto slices of sourdough bread, washed down with some elderflower and rose petal tea. As I pass around a plate of locally made cheese, Martin serves up the main event; hedgehog mushrooms, cooked simply with a little bit of butter, oil and thyme. Appetites satiated and ready for more mushrooms, our wanderings take us further into the trees. Someone spots a hedgehog mushroom at the edge of the woods and before long we’re all scrambling under the bracken to take a closer look at the curious fungi, their undersides covered in spines as opposed to the more common gills. The basket begins to fill and we venture further into the woods in search of more. The lessons continue with a curious Bolete family mushroom whose flesh turns a shade of indigo when cut; yet despite this rather frightening colour is still edible. Our final stop is in a lovely clearing spot where Martin spies a patch of meadow wax caps that are the final additions of the day to our basket.